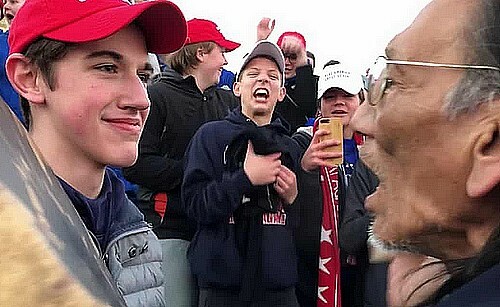 The face of racism is in the expression of a boy who mocks an elderly man. But you may also read as the great-grandson of an informal mass of colonizers, made up of people in search of fortune, but also murderers and criminals of all kinds, who allowed himself, under the objective of the camera and the laughs of his friends, to make fun of the victims’ descendant of the most neglected genocide in history, with at least one hundred million deaths. Here it is, the racism’s face. That smile as dull as without empathy. Those cold and without any intelligent light eyes. That scornful and intolerant face doesn’t come from nowhere. Someone, among so-called parents, bad teachers by profession or just by vocation, shameful examples, have drawn it on his bare skin. This is the face and the son.